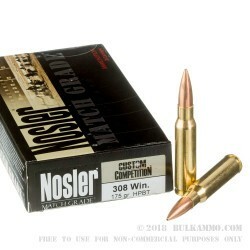 Nosler’s .308 Custom Competition round is designed for high performance during match shooting or for hunting. These rounds utilize Nosler’s custom-designed competition bullet and hand-selected high-performance powders to provide one of the most accurate and consistent rounds available. 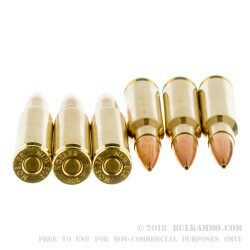 Featuring a 175-grain, hollow point boat-tail projectile, loaded into boxer-primed, noncorrosive, reloadable, Nosler-stamped brass cases and are capable of a muzzle velocity of 2500 FPS. The projectile features a small meplat and boat-tail design for better aerodynamics and a flatter shooting trajectory. Each round is visually inspected at the factory, ensuring consistency from round to round. 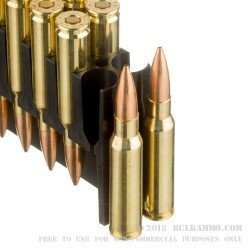 Each box of Nosler Custom Competition .308 contains 20 rounds. Since 1948, Nosler has produced some of the most accurate ammunition available. First started when the founder, an avid hunter, was disappointed with the rounds he used on a hunting trip, Nosler has grown to be a trusted brand worldwide and embodies American quality and ingenuity.